With my pointy arrow, I feverishly pen this postcard from Paris. Confession: I have a new favorite park. There, I’ve said it. It’s true. I do! 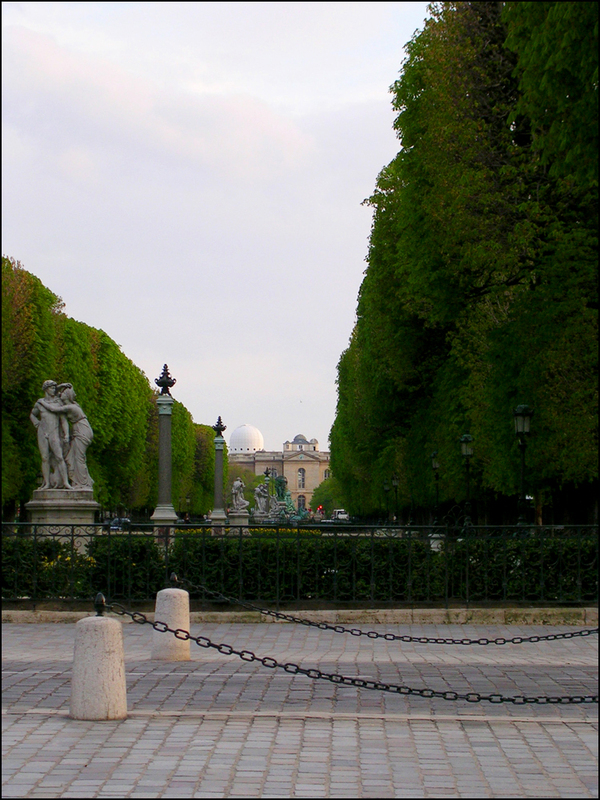 So with long looks and fiery chitchat, let’s roll on over to the Jardin du Luxembourg. During the springtime, I usually head to Luxembourg after my big weekend hunts at the flea markets. Here at the park, there’s never a shortage of benches or shady trees. It’s another prime people-watching hotspot, but you’ll also find beaucoup hideaways, perfect for reading and whispering sweet nothings. Created by Queen Marie de Médici and garden guru Boyeau de La Bareaudière with a fine Florentine twist during the 17th century, it launched in 1778. Flaunting sixty-something lush acres, Luxembourg has played muse to photographers Atget, Brassaï, and Doisneau. Painter Watteau paid homage too. It also had a recurring role in Victor Hugo’s novel “Les Misérables” and Ernest Hemingway’s novels and short stories. Here’s the poop! Rumor has it that in the years before Hemingway could afford to shoot lions in Africa, he hunted urban birdlife here by the Medici Fountain. 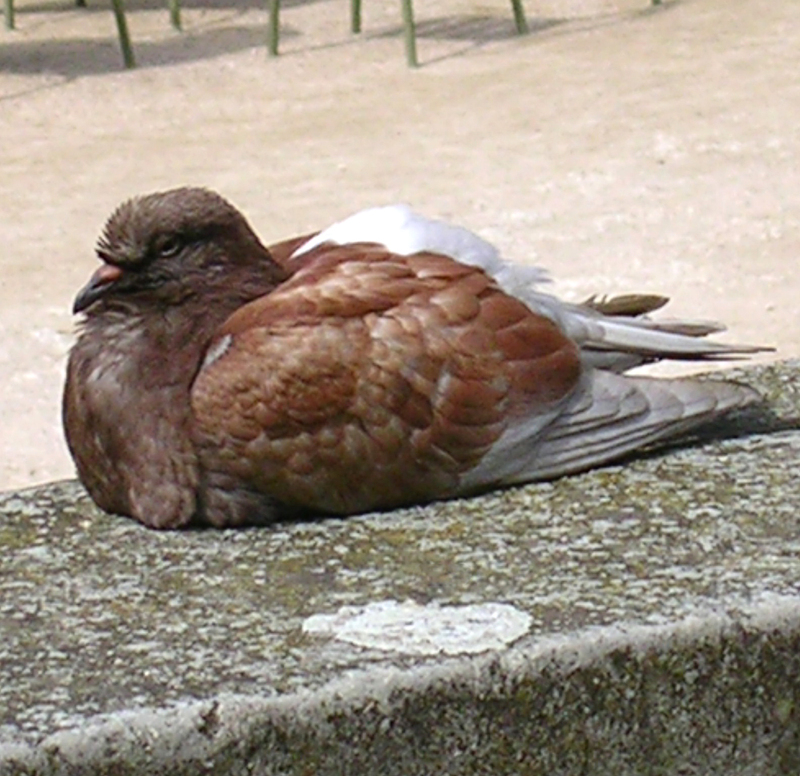 Back in his salad days, Luxembourg was known for its voluptuous pigeons! The Jardin du Luxembourg boasts a hefty collection of over 100 statues (celebrating former French queens and female saints), the Medici Fountain, the octagonal Grand Bassin pond surrounded by raised terraces, Bartholdi’s original Statue of Liberty prototype, a school for training bee keepers, and a théâtre des marionnettes! A hive of activity, this long list of attributes continues. There are also apple and pear orchards, flowerbeds with oranges, dates, gillyflowers and dahlias, and pomegranate trees. Let’s not forget sports like tennis, running, chess, toy boat racing, boules, petanque (the national game), donkey rides, and a carrousel where kiddies can try to spear golden rings with little lances from upon wooden horses! So where to score reading material? I recommend the San Francisco Bookshop for good used books in English. Located nearby at 17 Rue Monsieur le Prince (Metro Odéon), the cozy shop is where I recently picked up a well-loved copy of “A Literate Passion: Letters of Anaïs Nin & Henry Miller”). Talk about the ultimate starry-eyed read! Henry wrote: “I have not dared until now to say what I think. But I am plunging—you have opened the void for me—there is no holding back. I am in a fever.” Oh, sigh! La Brasserie Balzar is located at 49 Rue des Écoles, 5th arrondissement (Métro: Cluny-La Sorbonne). Try their signature profiteroles (mini pastries filled with ice cream)! Le Grand Bassin: Pack a parapluie! Another favorite is the Café de la Mairie at 8 Place Saint-Sulpice, 6th arrondissement (Metro: Saint Sulpice or Rennes). Located next to Église Saint-Sulpice, it was also a favorite literary haunt. Who else has found inspiration here? Besides Ernest Hemingway, Henry Miller and Anaïs Nin, scribes like Saul Bellow, Fitzgerald and Djuna Barnes were often afoot. And let’s not forget James Joyce, Samuel Becket and Edward Hopper—just to name a few more! What to order? I recommend trying their house Cantal jeune baguette and a pitcher of vin rouge. Then, sit out on the terrace and gaze up at the Église Saint-Sulpice! Tips for the road: I recommend the Notre-Dame des Champs Métro station because as you make your way to the park, you’ll pass a string of funky shops. And runners, each lap around Luxembourg’s well-maintained running path is 1.25 miles. So pack your shoes! As always, your blog come to me in the middle of my busy day and stops me for 10 minutes and transports me to Paris. Thank you and Merci! No…it is you and your blog that makes my day! I am fan of your beautiful photos and the research you put into every post. I’m trying to get my friends who are planning trips to Paris to follow. Again, Merci! I really appreciate your thoughtful words. Thanks also for spreading the word! What a gift. Oh, my! Enjoy the weekend!! T.
I feel myself plunging also…………and feel myself in a fever! ……..oh my! What a lovely place you have found. The face sculpture by Lotta Hannerz is spectacular! Oh you have quickened my heartbeat and I must find a shady place to sit and watch the people and perhaps even score a pigeon to pluck and take home to bake to a crispy goodness. Oh see you have me off on a wild and wonderful fantasy. What beauty you discover! I have so worked myself into a frenzy that I do believe a cold milk bath is in order! I am so sad I missed seeing the Jardins du Luxembourg last week!! It’s now on my list for my next visit. I did make it to Brasserie Balzar and enjoyed their Monday veal plat du jour, it was fantastic and had a terrific bottle of wine. Great post, thanks! My dear friend, Virginia, of Bellochio, inroduced me to you and pleased I am that she did so. It was only a year ago that I sat in this park; warmed by the sun as I experienced in its beauty. Jardin des Tuileries and many others. I also found homes stayed in by some of my favorite french writers such as Beaudelaire who once lived a block away from where I stayed on Ile Saint Louis. To that place there was a daily pilgrimage. Voltaire kept his mistress next door. I stood in another world as I gazed upon these homes imagining what it would have been like to have been with them. I had a grand time and dream of a return. You really bring Paris to life for someone who has never been. The first photo and the second last are both my favs. Hi, Theodora! I’ve just finished reading “The Paris Wife”, which is about Hem and his first wife, Hadley Richardson. Mr. Bumby is their infant son. Did you know that? 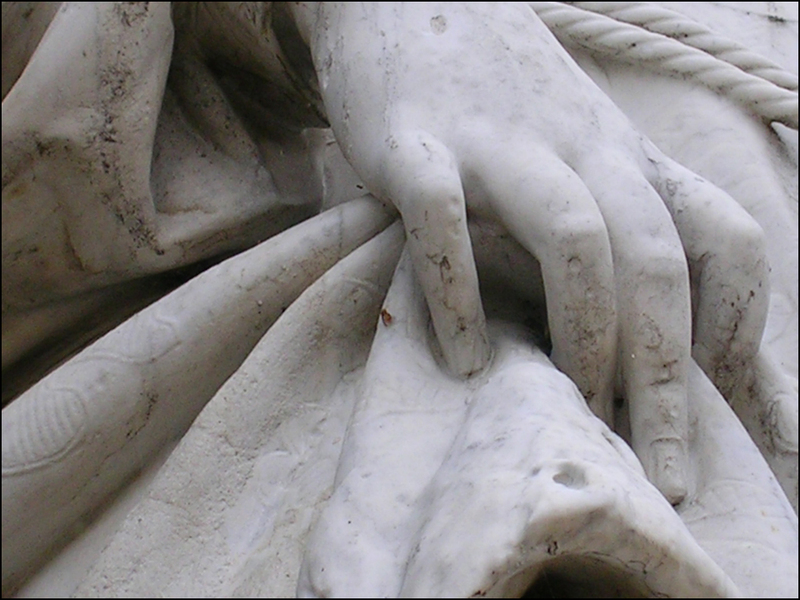 I love your pics of the sculptures! Nope, I haven’t read it. I’ve got tickets to hear Paula McLain speak during the Dallas Museum of Art “Arts and Letters Live” event on April 20. I liked the book; enjoyed “living in the ’20s – – in Paris” through her descriptions. I’m not sure what I think of Hadley. I think she loved him, but I don’t have a lot of respect for her for staying with him/putting up with him and his lovers for so long. Although I think he loved her, I think Hem’s feelings for her drastically changed, however, when she lost the manuscript. I, too, hold her accountable for that, even though she meant well. What about your feelings of Hadley? Also, what did you think of Woody’s “Midnight in Paris”? I loved it, although I’m not an Owen Wilson fan. I watched that movie during the time I was reading the book and that was fun! I’m sure, after seeing Paula McLain in person, it will weave its way into a post. Absolutely! I recently went to another Arts and Letters Live and saw Jonah Lehrer speak. Did you read that post of mine? The post is called Getting The Job Done. It doesn’t have to do directly with Paris, but it does have to do with creativity, which you are obviously gifted with. Certainly I’ll let you know when I do a Paula post. Thanks for your kind words about the blog. By the way it might be fun to meet up one of these days and share stories/ideas about the city. Let me know if you’d be interested in that sometime (I’m a pretty laid back unimposing walking partner). Happy blogging and take care! I’ve missed the gardens on my previous trips. Not this time! I see why Hemingway went for those pigeons, they’re practically chicken-sized! Yes, Krista! Add it to your list. The park pigeons and HUGE! And very tame. Poor pigeons! T.
I wish I was there now. Funny to think of Hemingway killing pigeons to feed his family. Not that I condone that–I didn’t know the story. Thanks for all the info. Great post, though I’m somewhere between being won over and grossed out by Hemingway’s pigeon-eating. Sigh. I will get there one day. Beautiful post. Beautiful, beautiful, beautiful. I love these photos. I love how the floating face in the fountain is mirrored in the background by the profile of the embracing couple, and then how that feeling is carried over into the next images. Wow, better and better. You constantly amaze me. Fine shots, and I really love your ‘little tours’! Merci!! I love creating the “little tours.” Art and shopping go hand in hand in my world! T.
I stay at a little hotel around the corner whenever I get to Paris. This is a lovely park for a morning stroll. Beautiful photos! I love the sculpture ones especially. Thank you for this perfect springtime stroll through the park. Great post, as per usual, Theadora! Do you know if the “face” sculpture is still there? That looks worth a trip! Personally, I prefer the Buttes Chaumont to the well-bred Luxembourg… What can I say? I’ve always been a right bank rat, slumming with les gens “populaires”! Thanks for the Hem quips! Always a favorite of mine and the pigeon in the bottom picture looks good enough to eat! brilliant! i love the quotes that you add in here, too. Everyone loves dandies, the bubbly and Oswald. of course. What a fabulous project. Keep me posted!! T.
Shakespeare’s bookshop just across the river from Notre dame is a wonderful bookshop! Hi Gilly! Great tip! I also love the Shakespeare and Company bookshop! Here’s the scoop! A favorite Beat Generation haunt, George Whitman (Walt Whitman’s nephew) opened the rue Bûcherie location in 1951 under the name of Le Mistral. He changed its name to Shakespeare and Company as a tribute to his friend Sylvia Beach after she closed up the original shop by the same name, which had been a few blocks away. Until December 2011, George himself held court here, but alas he is with us no more. RIP, George. Fantastic opening pic. 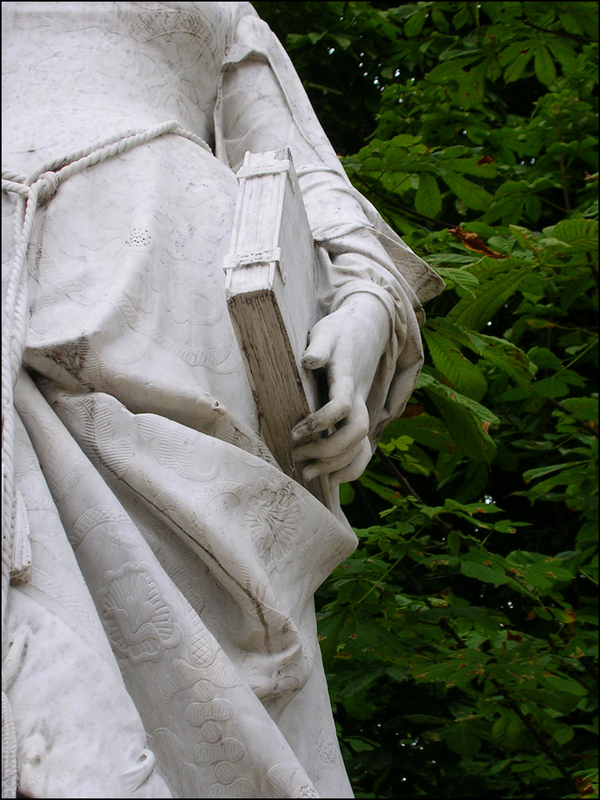 Also, neat closeups of the statutes, I may try that in Cental Park. Continue to save these for reference – I will get back to Paris someday. The photos and the quotes are great. Thanks so much for sharing. Thanks..I look forward to seeing more of your posts. You have so many comments here.,……I hate to take up more space. I have a friend who lives near the LG…5 floors…..she calls it her “money pit”. I spend a wonderful afternoon at this park last fall and your post brought back a lot of memories for me. Sounds great! Wish I were there. I’d also love to shoot some pigeons. :-0 Our younger daughter will be going through Paris Wednesday on her way to Provence, but not long enough to see more than the airport and the TGV station. I’ll tell her to wave. A sumptuous post packed full of life and love and details. Love the nose in the water – so unexpected. I thought for a moment it was real, with a trick of perspective.. I think the descriptions of food and restaurants are amazing. So atmospheric. It’s a city of hope. It’s always on my horizon, even on those grey wintery days! My sister lives 5 mts walk from Place de la Contrascarpe so I’m lucky to be able to visit from time to time! This was a great post. I love that you pointed out Hemingway’s history in the garden as well as the female focus. I really enjoy bringing clients through the Luxembourg on our trips because of those two things –and of course because it’s beautiful. What’s also wonderful to see the fruit trees that have been gathered and protected and grown in that park for hundreds of year….It’s my favorite place to do our weddings too. I love the fountain because of the color. I wish we had done a wedding there while that mobile was in place. Very cool. Very beautiful, creative pictures and words! Love the line drawings too. Suddenly I have been transported to another world. Thank you Theodora for coming to mine! Oh, we love this park. My husband used to live nearby and we often stayed in the area when we visited later on–we’ve even gone jogging there (is that so “American”? Perhaps). Anyway, so fun to read your post–I didn’t know the history of the park until now. Oh, that’s the only place I’ve run–I’m not as much of a runner as I wish I were! I think my husband did participate in a few races a while ago, I’m not sure where else he ran at the time. Sounds like your races have been fun. Wonderful nose in my favorite park in Pairs. 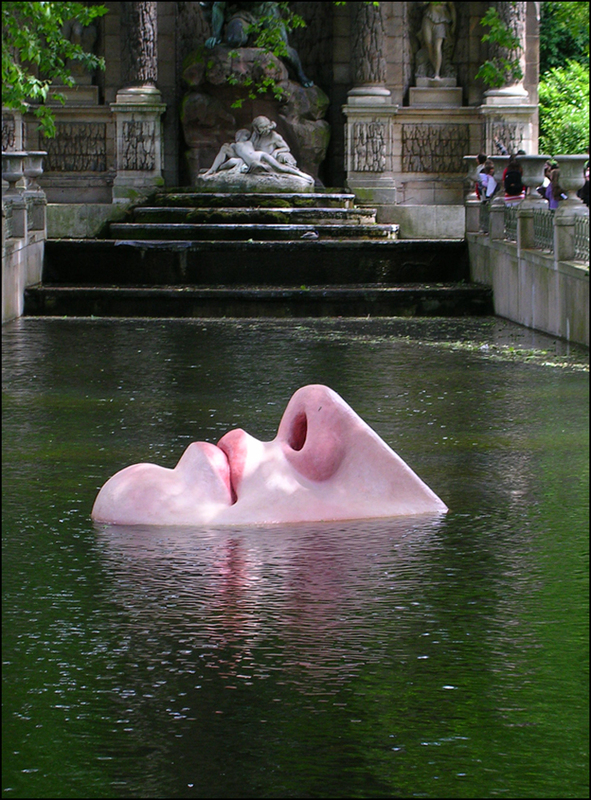 Parisians always seem to add something that is “different” to their monuments…not always liked, but always interesting… from this nose in the pond..to cartoon figures from a Japanese artist I “enjoyed” in my visit to Versailles in …and once even the Eiffel Tower. Love your dexterity in subjects.. Thanks for your thoughtful words! 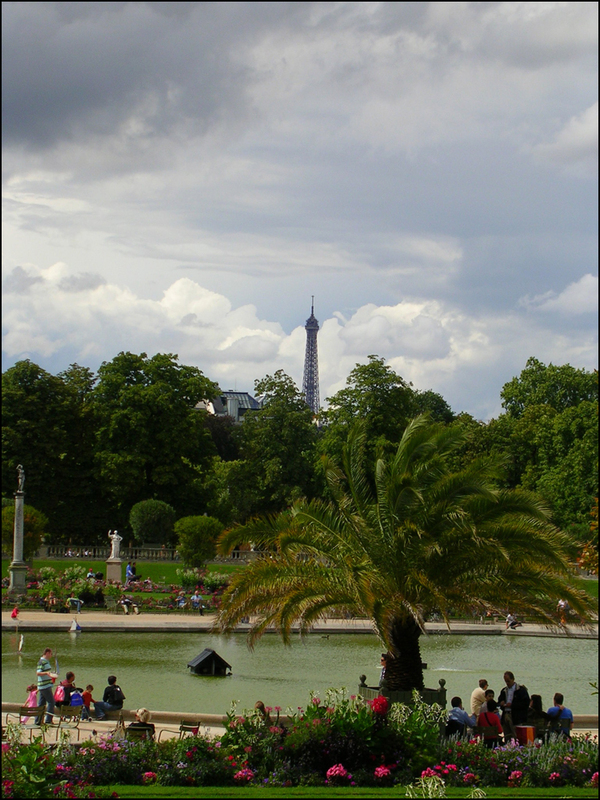 Yes, I love the “French Twist.” Say, do you have a second favorite park in Paris? Do spill. T.